Hanne Marie le Fevre is a Danish performance artist and classically trained mezzo soprano. She has a wide-ranging carreer involving solo performances in various oratorios and masses, to experimental installations and interdisciplinary collaborations with actors, dancers, writers, electronic and jazz musicians. Her heart beats for early and contemporary music – and of course some French chansons now and then. In 2014 Hanne finished her bachelor's degree from the Royal Academy of Music in Aarhus and she is currently doing her masters at the Royal Danish Academy of Music in Copenhagen. In between she has taken private lessons in Paris. 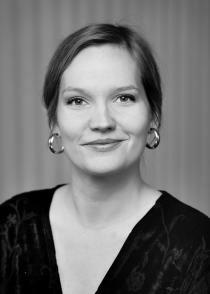 Hanne has been a member of Ars Nova Copenhagen since the beginning of 2017 and also sings in Holmens Kantori & Vocal Ensemble and Musica Ficta. In addition to her work as a musician, Hanne works as a volunteer at Hjælp Voldsofre (Help Victims of Violence), where she is a mentor and facilitator for networking groups.